While discussing with some colleagues the other day, I realised that the University of Mauritius website does not have a working search facility. I also realised that it would be nice to be able to search within all UoM websites (like, for example, the CSE website, the Radio Telescope website, etc.) in addition to the main website of the university. 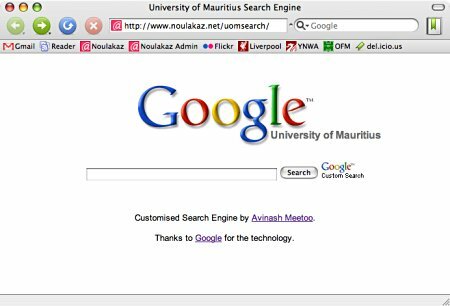 which I’ve called the University of Mauritius Search Engine. too great :) do you think you could include image search such that we could be searching for images you’ve put on the original uom site or something like that? I’m happy you see the value of this search engine. I’ll try to see if I can include image searches. surely, there must be some intellectual property issue in placing “University of Mauritius” as part of the google logo? isnt Sergey Brin one same person??? i thought the founders were Larry Page and Sergey Brin?? I wanted to know: is it possible to view the exams results online on the uom website??? I’m told one student could, but I’m looking for it on the site and it’s nowhere to be seen.